Fibromyalgia is an incurable musculoskeletal disease that causes extensive muscle and joint pain, as well as fatigue and depression. Incredibly, more than 12 million Americans have been diagnosed with fibromyalgia, mostly women between the ages of 25 and 60. Despite the fact that there is no cure, there are ways to combat the symptoms of fibromyalgia. Aside from specialized pain medications and staying generally healthy and in good shape, a good fibromyalgia mattress specialized made to comfort sore joints and muscles affected by the disease could do wonders to ease symptoms. Can A Mattress Really Help with Fibromyalgia? The short answer is yes! Many people with fibromyalgia complain about poor quality of sleep. This stems from a number of problems associated with fibromyalgia, including insomnia, sleep apnea, night sweats, and restless leg syndrome. Because one of the major problems with fibromyalgia patients is acute joint pain, a mattress that is too firm can aggravate certain pressure points, exacerbating rather than healing the problem as you sleep. A mattress with the softness to cradle your contours as well as the support to keep your joints aligned can help your body recovery while you sleep, and you can awake refreshed. Further, a well-ventilated mattress can help control hot flashes, making a non-breathable mattress damp and uncomfortable, which detracts from the quality of sleep. According to Debilitating Diseases Website, there are a number of options available that could fit any budget. From specialized memory foam mattresses to hybrid spring mattresses, there are options for treating your symptoms while you sleep! Wake up, feel better, and face the day! What Are Fibromyalgia Mattresses Out There? Innerspring is generally the most popular mattress type available, a traditional option. These mattresses are very breathable and provide firm support. However, a good and durable innerspring fibromyalgia mattress could cost a pretty penny. A thrifty mattress will not have good spring durability. You will end up spending more money in the long run if your mattress turns lumpy, and you will have to replace it to ease your symptoms. A good option for inspiring mattresses for treating fibromyalgia are hybrid, memory foam spring mattresses. 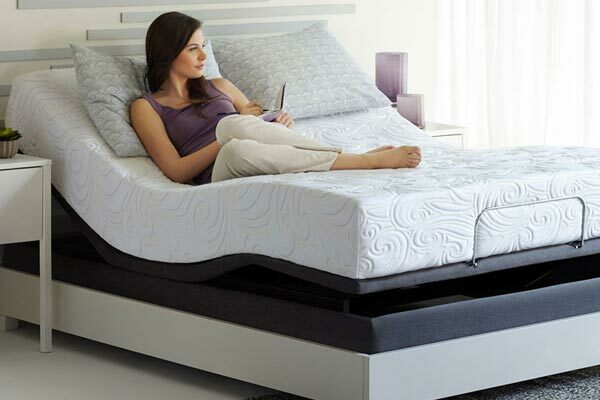 I would recommend checking out the LinenSpa 8” Memory Foam and Innerspring Hybrid Mattress. For less than $200, you get the firm support and breathability of an innerspring mattress along with the cradling of memory foam, for a fraction of the price of an entire memory foam mattress. As a further bonus, this mattress has a 10-year warranty to protect against weak springs, and it arrives at your doorstep in a compressed box for simple delivery and set up. For less money than you are probably paying in pain medications from a doctor, you could get both the targeted pressure point relief of a memory foam mattress as well as the strong support and breathability of a traditional innerspring mattress. For those looking to buy a new fibromyalgia mattress on a budget, this is definitely a good option. Latex is the most popular material for natural fiber mattresses, but they are also available in bamboo, coconut coir, organic wool, organic cotton, or hemp. The former is a good option because it is generally more affordable and is hypoallergenic. The latter are good options because they can appease the environmental activist inside of us, and use natural materials without chemicals and are unlikely to affect allergies. For good (albeit more expensive) option for a fiber mattress other than memory foam, consider the Tuft & Needles Mattress. It is made with specially made Adaptive Foam that relieves pressure points like memory foam, but it also preserves a localized bounce and cools with a gel and graphite formulation engineered by respected scientists. This mattress comes with a 100-night warranty, so if you are put off by the higher price tag but are interested in spending the money if it is a worthwhile investment, you have no fear! This adaptive foam mattress avoids the breathability problems of the memory foam mattresses and also avoids the fragility of traditional spring mattresses. If you’re looking for a strong investment in a tried and tested fibromyalgia mattress, the scientifically modern Tuft & Needle Mattresses may be the mattress for you. This final mattress type has gotten a lot of press since its creation. It seems everyone is familiar with the wine glass remaining stable six inches away from a woman jumping on the memory foam mattress. It’s this quality that has given the material such a high reputation, and it is an excellent option for those with fibromyalgia. It’s soft yet firm structures allow it to contour to your body, aligning spines and joints for a good night’s sleep. Further, it will allow an uninterrupted night’s sleep for partners of those with fibromyalgia as they will unlikely to be disturbed by the movements and the restless legs of their fibromyalgic spouse. Because of its popularity, the price point has lowered so that there probably exists a memory foam mattress in your price range. A good option in this category is once again, another hybrid. The Zinus Memory Foam 12 Inch Green Tea Mattress is a bestseller. It’s a combination of Memory Foam, Comfort Foam, and Airflow High-Density Foam and Base Support Foam creates a mattress that cradles like memory foam, has the support of an innerspring mattress, and breathes like newer, scientifically designed mattresses. The price point of this mattress is also attractive. For just under $300, you can purchase a fibromyalgia mattress that has the time-tested and respected material of memory foam. The Zinus Memory Foam 12 Inch Green Tea Mattress is also shipped in a conveniently small box but unrolls to a thick foam mattress that might be the first step toward alleviating your fibromyalgia. There are many treatments for fibromyalgia, but unfortunately, there is no cure. The ways to best treat your condition, however, are simple. Eat well, stay healthy, and sleep. With cheap and uncomfortable mattresses flooding the market, it may be difficult to know where to look for the best mattresses to alleviate fibromyalgia induced pain. These three categories are good places to start. The mattresses recommended in this article test, well reviewed, and readily available in convenient shipping packages with easy returns. A good night’s sleep can help with any ailment. What are you waiting for? Try of fibromyalgia mattress today! Is Turmeric Good For Fibromyalgia? I want to know if any of the mattresses in a single size can be used on a hospital bed. ( head and feet moveable up and down) as I have hospital bed but hate the mattress it is covered in washable plastic and is very very firm but the company has said it is only mattress they supply. Thank you for the above: I, too, would like to know if these mattresses are available in Australia (especially Brisbane, QLD)?